I'm obsessed with dresses, I mean what can I say? I like sophisticated, feminine, independent dresses the most. I also, most days would prefer to wear casual, comfortable dresses with Uggs or flat boots, but hey, that's what I like. 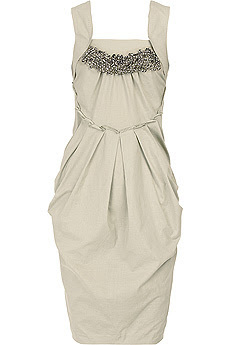 Today, I want to share with you, this wonderfully shaped dress by Vera Wang. I think that this dress would look perfect on someone with a Kerry Washington type of shape or someone with even a little more body. The pockets and the pleats may add some unexpected volume to the mix, but the square neck and the embellishments will draw the eye elsewhere. Don't forget to admire the braided waist decor, which solidifies Vera's never exaggerated, simple, feminine fashion perspective, this dress is a show stopper. Price point $1080.00. You have to wear, really funky shoes with this. How about these, Giuseppe's? They are priced at $563.00. 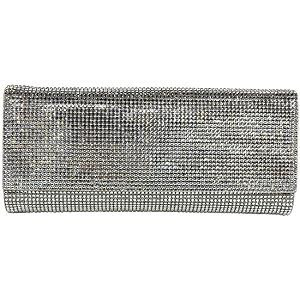 And this Judith Leiber evening bag from Bag, Borrow or Steal. $85.00/week or $250/month to rent. Thank you for writing about us! I personally love that Leiber clutch, and we have quite a few members who rent this one for weddings and special nights out. If we can ever answer any questions for you or your readers, please let us know!